These trailers are for sale by dealers and not sold directly through Trail Boss Conversions. Follow the links below for detailed information on each unit, including dealer information. Mustang Series w/Trail Boss Interior! Model: Mustang Series w/Trail Boss Interior! 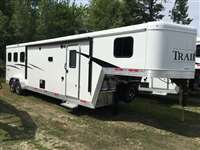 4H PC Load 15' Trail Boss LQ, ON ORDER!!! Model: 4H PC Load 15' Trail Boss LQ, ON ORDER!!! 4H 15' Trail Boss LQ, Slide, Pod & Gen. ON ORDER! Model: 4H 15' Trail Boss LQ, Slide, Pod & Gen. ON ORDER! 4 Horse Side Load w/ 12.8 Ft Trail Boss - LOADED! Model: 4 Horse Side Load w/ 12.8 Ft Trail Boss - LOADED! 5H PC Load 15' Trail Boss LQ FULLY LOADED!!! Model: 5H PC Load 15' Trail Boss LQ FULLY LOADED!!! 4 Horse Custom Elite w/Trail Boss Conversion. Model: 4 Horse Custom Elite w/Trail Boss Conversion. 4H 15' Trail Boss LQ, Slide-out, Pod, ON ORDER! Model: 4H 15' Trail Boss LQ, Slide-out, Pod, ON ORDER! Side Load/Rear load Generator Very Custom Trailer! Model: Side Load/Rear load Generator Very Custom Trailer! Model: Slideout, Generator., Sat., loaded! 4H Double Slide Custom Trail Boss! LOADED! Model: 4H Double Slide Custom Trail Boss! LOADED!